The Salento winegrowing region is characterized by the dominant grape Negroamaro, which offers lovely fruit embossed scents, great fullness, rounded tannins and great balance. Therefore, they produce a portion of Primitivo, which shares DNA with the American grape Zinfandel. 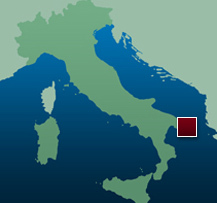 Previously, Salento was a bulk wine supplier to the northern Italian wineries. Today their wines receive top marks in the Italian wine bible Gambero Rosso. The wines generally offer the classic southern Italian fruit sweetness and are therefore suitable for most dishes - such as grilled meat, pasta, vegetable dishes and cheese or just to sit and enjoy without food and good company. Alsace has 118 wine-producing villages which lie nestled among the forested peaks of the Vosges mountains. The plate shifts that occurred during the genesis of Europe have left a richly complex jigsaw puzzle of 13 different soil types. Between the soil, rainfall and shelter from the mountain range the conditions for wine couldn't be better. The wines from this region are among the elite of European white wines. Alsace is the northern most wine region in France. The uniqueness Alsace white wines provide make them perfect for almost any dish you desire. Navarre is a wine region in constant developement. For many years, Navarre was synonymous with inexpensice rose wines produced from Garnacha grapes. In the 1980's growers began to gravitate toward the more international varieties. Now there is a new developement underway with more focus on grapes such as Mazuelo, Graciano and Garnacha. The climate in Navarre can satisfy nearly every need thus making it a little piece of undiscovered paradise.